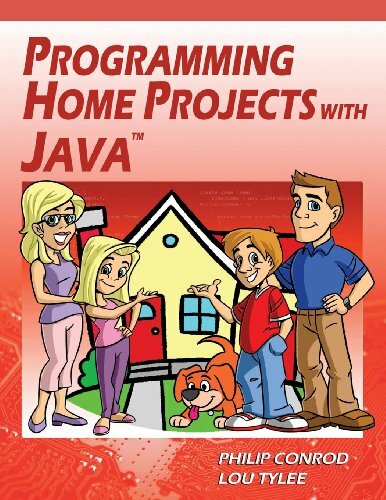 PROGRAMMING HOME PROJECTS WITH JAVA teaches Java GUI (Graphical User Interface) programming concepts and provides detailed step-by-step instructions in building many fun and useful projects. To grasp the concepts presented in PROGRAMMING HOME PROJECTS WITH JAVA, you should possess a working knowledge of programming with Java and be acquainted with using the Swing control library. Our tutorial LEARN JAVA GUI APPLICATIONS can help you gain this needed exposure. Dual-Mode Stopwatch - Allows you to time tasks you may be doing. Consumer Loan Assistant - Helps you see just how much those credit cards will cost you. Flash Card Math Quiz - Lets you practice basic addition, subtraction, multiplication and division skills. Multiple Choice Exam - Quizzes a user on matching pairs of items, like countries/capitals, and words/meanings. Blackjack Card Game - Play the classic card game against the computer and learn why gambling is very risky. Weight Monitor - Track your weight each day and monitor your progress toward established goals. Home Inventory Manager - Helps you keep track of all your belongings - even includes photographs. Snowball Toss Game - Lets you throw snowballs at another player or against the computer. The tutorial includes over 850 pages of color self-study notes. The Java source code and all needed multimedia files are available for download from the publisher's website: (KidwareSoftware.com) after book registration. PROGRAMMING HOME PROJECTS WITH JAVA requires a Microsoft Windows XP-SP2, Vista, or the Windows 7 operating system. You also need the Java Development Kit (a free download). This tutorial also uses JCreator® 5.0 as the IDE (Integrated Development Environment) for building and testing Java applications. If you have any questions about this product by Kidware Software, contact us by completing and submitting the form below. If you are looking for a specif part number, please include it with your message.